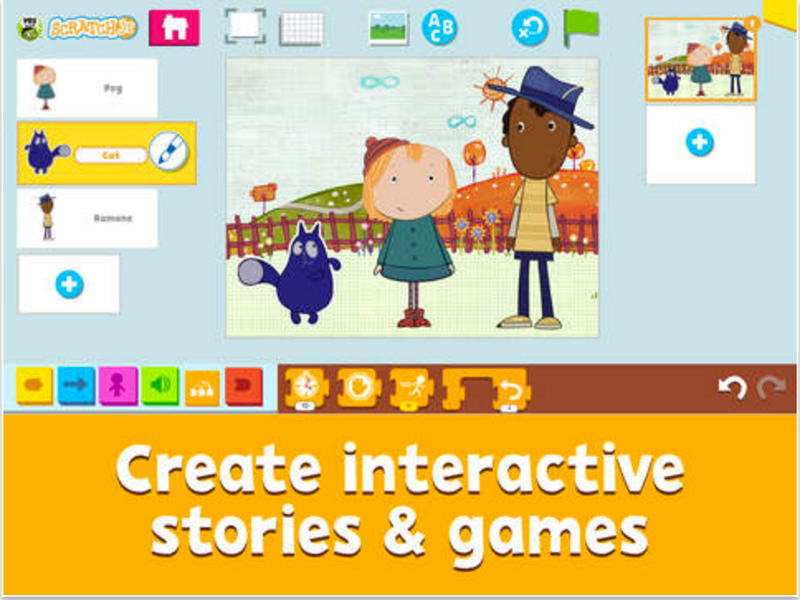 PBS KIDS Scratch Jr is a new app to help kids ages 5-8 learn coding skills through creating games and interactive stories. The app is a fruit of a collaboration between PBS, Tufts University, the MIT Media Lab, and the Playful Invention Company. Kids can use pre-made characters or create their own using different programming blocks that can be easily snapped together to animate characters and make them move, dance, jump or sing. In doing so, kids get to practice a number of key conceptual skills that involve problem-solving, project designing and strategic thinking. Some of the main features provided by PBS KIDS include: over 150 characters and backgrounds for kids to use in their projects, these characters are based on kids favourite shows such as Wild Kratts, Nature Cat, WordGirl and many more; easy to use colourful programming blocks to create sequences of actions that cause characters to animate and interact in fun and exciting ways; ready to use story starters designed to encourage students edit and complete their stories the way they like; voice recording functionality to help kids record their own voice and add sounds to their projects.